از آنجا که امروزه بحث تبدیلات بین سیستم‌های مختصات در فعالیت‌های نقشه برداری و ژئودزی و علوم مرتبط با اطلاعات مکانی کاربرد ویژه‌ای دارد، به منظور افزایش دقت در انتقال بین این سیستم‌ها، استفاده از روش های جدید و کارآمد مورد اهمیت است. هدف اصلی این مقاله در بخش اول بررسی تبدیل مختصات محلی شهر اصفهان به مختصات Utmوبالعکس با استفاده از روش ضریب مقیاس ترکیبی است. لذا از مختصات 500 ایستگاه GPS موجود در شهر اصفهان با پراکندگی مناسب استفاده شد و با پیاده سازی روابط تبدیل فواصل از روی سطح زمین به صفحه نقشه، مختصات این نقاط در سیستم محلی بدست آمد. بررسی تغییرات ضریب مقیاس ترکیبی برای نقاط GPS شهر اصفهان نشان داد که اگر از یک ضریب مقیاس واحد برای کل شهر استفاده شود اختلافی در حدود چند دسیمتر در طول‌های بلند ایجاد می‌شود که مناسب تهیه نقشه دقیق نیست. از آنجا که در تبدیل معکوس از سیستم محلی به سیستم UTM با کمک مدل‌های جدیدی همچون مدل توابع گویا، علاوه بر موقعیت مسطحاتی در سیستم محلی نیاز به دانستن مؤلفه‌ی ارتفاعی نقاط می‌باشد، در بخش دوم مقاله به ارائه الگوریتمی جهت درونیابی ارتفاع نقاط معابر شهر اصفهان با استفاده از داده‌های لیدار پرداخته شد. ارزیابی نتایج این درونیابی با تست بر روی ارتفاع نقاط GPS شهر اصفهان، نشان‌دهنده‌ی کشف یک بایاس 30 سانتیمتری در نقاط ارتفاعی لیدار شهر اصفهان است.پس از حذف این بایاس، مقدار RMSEبرابر 43 سانتیمتر، جهت درونیابی ارتفاع نقاط داخل معابر شهر اصفهان در دیتوم WGS-84بدست مى آید. Coordinate systems transformation has an important role in mapping activities, geodesy and spatial science. New and efficient methods are needed in order to increase the accuracy in the transformation between these systems.The main purpose of this article in the first part, is a local coordinates transformation in Isfahan City to UTM coordinates and vice versa. This method is based on the combined scale factor. 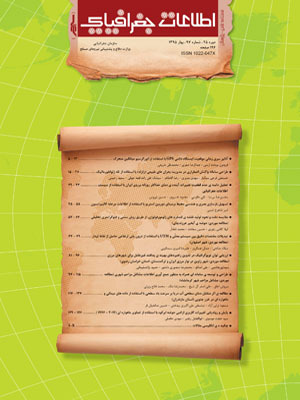 So, the coordinates of 500 GPS stations in Isfahan City were used,and with reduction of distanceson the surface of the earth to the map, coordinates of the GPS points in the local system were calculated.Study on changing of combined scale factor for the GPS points of Isfahan City shows that if a unit scale factor is used for whole the city, in long lengths occurs a few decimeter differences and it is not suitable for accurate mapping. LIDAR is a mature remote sensing technology which can provide accurate elevation data for both topographic surfaces and above-ground objects. So in the second part of the article, we presented an algorithm to provide height interpolation for the points in the passage network of Isfahan City by using LIDAR data,because the inverse transformation from local system to UTM using new methods such as Rational Functions, needs vertical component in addition to horizontal position of points.A height bias of 30 centimeter has been detected in the LIDAR data using GPS control points. After removal of this systematic component, the final RMSE of LIDAR heights is 43 centimeters. 1- Di, K., et al. (2003), “Rational functions and potential for rigorous sensor model recovery”. Photogrammetric Engineering and Remote Sensing, 69(1), pp. 33-41. 2- Hu, Y., et al. (2004), “Understanding the rational function model: methods and applications”. International Archives of Photogrammetry and Remote Sensing, 3, pp1-6. 3- Jamie, C. et al. (2012), “Lidar 101: An Introduction to Lidar Technology, Data, and Applications.” (NOAA) Coastal Services Center., http://coast.noaa.gov/digitalcoast/_/pdf/lidar101.pdf. 5- Ledoux, H., (2006), “Modeling Three-dimensional Fields in Geo-Science with the Voronoi Diagram and its Dual.” Ph.D., School of Computing, University of Glamorgan. 8- Snyder, J. P., & Geological Survey (U.S.), (1987), "Map projections-a working manual". Washington: U.S. G.P.O. "Surveying & Positioning Guidance Note 1". (2008) “Geodetic Awareness Guidance Note,’, http://www.iogp.org/pubs/373-01.pdf. 9- Thomas,G.B.,et al. (1988), “Calculus and Analytic Geometry”. Addison-Wesley, Seventh Edition. 10- Yunfei, Bao et al. (2008), “Classification of LiDAR Point Cloud and Generation of DTM from LiDAR Height and Intensity Data in Forested Area. In: The International Archives of the Photogrammetry, Remote Sensing and Spatial Information Sciences, Beijing, China, Vol. XXXVII, Part B3b. 11- Zaletnyik P. (2004) “Coordinate transformation with neural networks and with polynomials in Hungary” , International Symposium onModern technologies, education, and professional practice in geodesy and related fields, 4-5 November 2004, Sofia, Bulgaria, pp.471-479. 12- Zeng, H. (2010), “A 3D coordinate transformation algorithm". The 2nd Conference on Environmental Science and Information Application Technology, 195-198.